Treviso Airport (used by Ryanair and at least one other budget airline), which is 25 km or 16 miles from Venice. Alilaguna Blue and Orange Line airport boats make it easy to reach almost any neighborhood in the city. They're especially convenient if you're staying near the Piazza San Marco. Water taxis are quick and convenient, but they're expensive (at least €110 from the airport to most hotels), and some hotels don't have water landings nearby. Water taxis can be difficult to board when the water level is high or low, and you'll need to haul your own luggage on and off the boat. 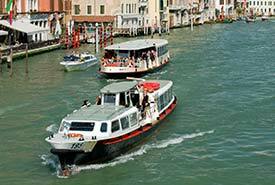 See the Warning about Water Taxis in our Venice Travel Blog. Your best bets are the Tronchetto parking island (next to the historic center) or--less expensively--a parking lot on the mainland. Our Parking in Venice article has details and Web links. Luggage can be a nuisance anywhere, but in Venice, it's often a serious burden. Hauling bulky suitcases over bridges or down narrow, crowded streets isn't fun, and on the vaporetto, you may be charged for an extra ticket if you travel with more than one suitcase (maximum combined height, width, and depth of 150 cm or 59 inches). Yes, but single boat fares for non-residents are outrageous. If you plan to use water buses extensively, consider buying a 12-hour to 7-day ACTV Tourist Travel Card or (if you're staying a while) the Venezia Unica discount card for long-term visitors and residents. For advice on using water and land buses, buying tickets, etc., see our transportation index. Most are. The most convenient boats for wheelchair users are flat-decked, single-level vaporetti (used on the popular No. 1 and No. 2 lines), but motoscafi (which have passenger cabins inside the hull) have mostly been rebuilt to accommodate wheelchairs at deck level.